Speaker, author, and EdTech evangelist, Steve Anderson is as knowledgeable and helpful as they come. If you’ve ever participated in a Twitter Edchat, you know Steve’s work. 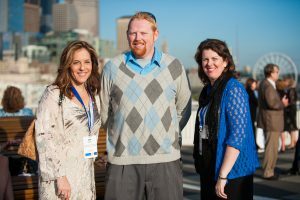 Like many of the presenters, Steve and I go back many years and my fondest memory is of working with him on one of the Microsoft Innovative Educator National Forums in Seattle. He is one of the founders of the highly successful Twitter chat. Many people profess to be experts in using Twitter and social media, but Steve is the real deal. Be sure to check out Steve’s sessions and join one of his #edchats. 1. What is your background in education? I started out as a Middle School Math and Science Teacher. I did that for a number of years until I moved into Edtech. I’ve worked as a school-level Instructional Technologist, a district level instructional Technologist and then to Director of Instructional Technology. I have a Bachelors Degree in Middle Grades Education and a Masters Degree in Instructional Technology specializing in Instructional Design. 2. What unique message do you bring in your keynotes? I try to blend humor with hope. I like to get my audiences reflecting on their learning and bringing a message of how awesome it is to be an educator today. I also like to look at how being a connected educator affects our ability to share and to learn and grow from others. All this wrapped in a lot of conversation and fun! 3. What’s the weirdest thing that has ever happened to you while presenting? I had a fire alarm go off in one of my keynotes a few years ago. We had to evacuate the building and keep the learning going by breaking off into small groups and discussing how we would share our learning. Picked right up when we were able to get back in. 4. Is there anything (related to edtech) you expected to see fully embraced in schools by now, but are disappointed to see it has yet to be fully adopted? Briefly explain the barriers. I still think there are apprehensions to the use of social media both for learning and for sharing. Social Media is so powerful and we see how it is used in other aspects of our lives yet there are still adults that think kids use it in ways that are inappropriate or ineffective. The reality is that schools and districts that use it both for learning and communicating are reaping the rewards of engagement both by students and their communities. 5. What do you see happening in Charter or private schools that you think our public schools could learn from? I very nearly sent my oldest daughter to a charter school here where I live in NC. While those students were held to the same accountability standards as students in the public schools they had flexibility in how they delivered content. It was an Arts Based school that brought music and art and making into every aspect of the student day. There are lots of arguments against Charters, mostly on the way that they are managed but if we look at the examples out there where students have freedom and flexibility to create their own paths to learning we can easily recreate that in our public school systems, often times more effectively. 6. What is one compelling reason for parents to keep their students in public schools? While I considered a Charter school for my oldest I still decided to send her to a public school because she could have many more opportunities for activities and working with kids from all walks of life. It’s important for kids to see the world as it is, and not a sanitized view that some Charters provide. I wanted her to also have the services she needed to succeed like Speech Therapy that couldn’t be provided by charters because they simply don’t have to be. Public schools are still the bedrock and foundation of our education system and we all should do what we can to ensure that every kid, no matter their background has equal opportunities to succeed. 8. What kind of kid were you? I was the kind of kid that teachers went to other teachers at the beginning of the year and they apologized for having me in their class. I talked a lot, moved a lot and spent a lot of time in the principals’ office. But I really did (and still do) love school. I loved to learn then just as I do now and I think a lot of my behavior was the result of boredom and not being challenged. In High School I had a teacher say to me that I was going to grow up and be a teacher. I hadn’t really thought about it up until that point but it turned out Ms. Carrol was right. I did grow up to be an educator and I love every minute of it. 9. What are you most excited about right now? I am excited for education in general. We live in an incredible time to teach and learn. At no other time in human history have we had so much access to information and the tools to make our learning so public. While the attacks on education continue, those of us who do it every day know there are amazing things happening and kids having incredible opportunities. As the advancement of technology continues I believe we will see these trends continue. We still need to remain skeptical about how hardware affects learning but we also can be open to the possibilities. 10. Anything else (message, links, etc.) you would like me to know and/or write about. Anyone can follow me on Twitter (@web20classroom) and you can check out my website (http://www.web20classroom.org). There you can read my blog, check out my books and see where I am speaking next!